Following a successful surgical procedure, DC tongues and Capitol Hill wags are beginning remark that FLOTUS has not been seen in public at all for over two weeks. US first lady Melania Trump has been out of the public eye for 15 days — an unusually long time for such a visible figure — following "successfully" coming through a surgical procedure at the Walter Reed Medical Center in the Washington, DC, metro area. 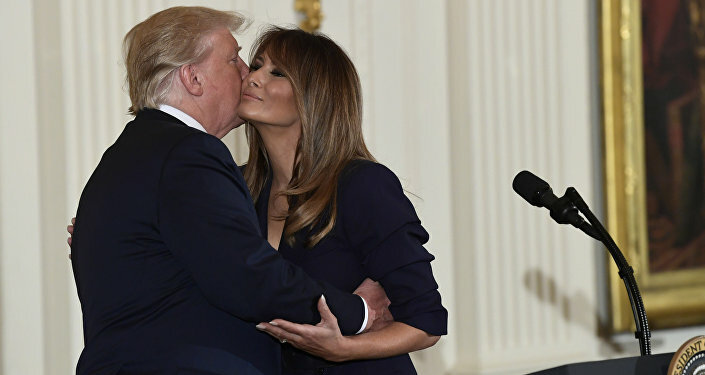 On May 14, the White House announced that the wife of US President Donald Trump had undergone a kidney procedure to treat a benign condition. "First Lady Melania Trump underwent an embolization procedure to treat a benign kidney condition," a statement from the White House communications director revealed. The statement reported that the procedure was "successful and there were no complications." The White House did not reveal additional details about her condition. The president was not present during the procedure, but spoke to her before the procedure and with her doctor afterward, according to NBC. On Friday morning, as Trump was preparing to board the Marine One helicopter to attend the US Naval Academy commencement ceremonies, a reporter asked the president where his wife was. Trump pointed to the White House and remarked that "she's doing great. She's looking at us right there." Big Fat UK Royal Wedding: The Obamas Over the Trumps? What Will Melania Wear?